I have been teaching art and crafts in community venues, schools and colleges for over 20 years. 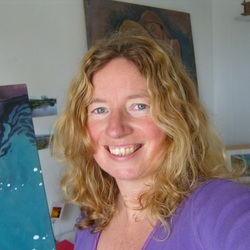 I have been involved in several Arts for Health projects, ran the Fine Art Textiles Foundation Degree course at Cornwall College, and helped set up an Outreach project, in collaboration with Cornwall College's Community Education department, teaching art in community venues to vulnerable groups. Over those years I found textiles to be the most accessible art form for people who were unsure of their creative ability. There’s something wonderfully familiar and playful about working with fibres and fabrics. Due to demand, though, 5 years ago, I began to teach painting and drawing instead, which I have found really fulfilling and exciting....I started working specifically with "beginners"....I love witnessing the emergence of a raw natural talent in someone who felt convinced they didn't have an artistic bone in their body!! My first two "beginners" groups have now become very competent, some of them are already selling their paintings....but they still come to the studio to build their skills further and enjoy the social interactions! All classes are run from my new studio at Raftra (TR19 6JZ), 5 minutes drive from St Buryan & Sennen, 20 minutes from Penzance. I am happy to work with all levels of experience. Groups are kept small in order that I have time to give individual attention to students.